This Welsh wholecloth is a real “farmhouse” quilt, relatively simple in design and execution, but with evidence of having provided many years of serviceable warmth. 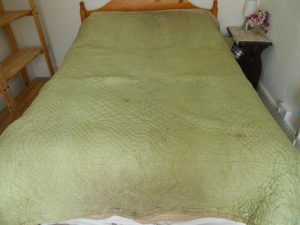 I paid very little for it on EBay, mainly because it was absolutely filthy, particularly at the middle of some of the edges – my theory is that a farmworker with muddy boots often sat on the bed to remove them! On the basis that I had nothing to lose, I washed it in the bath, and managed to scrub away most of the dirty patches – as well as washing out years of coal dust, which turned the water a deep orange/brown through several rinses. 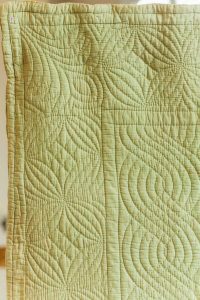 The quilt is a soft plain green on one side, of which a close inspection of the area hidden from the sun inside the butted edge reveals was originally a brighter apple green. Another plain fabric is found on the reverse – a mid-toned gold/mustard colour. The fabrics are cotton with a slight sheen, and both sides are pieced from 28” widths, indicating that it was made no later than the early years of the twentieth century, as improved technology allowed wider widths to be woven after this. The spray/fan is repeated four times to make this central motif. Unusually for a Welsh quilt, this is not contained within a double-lined circle. 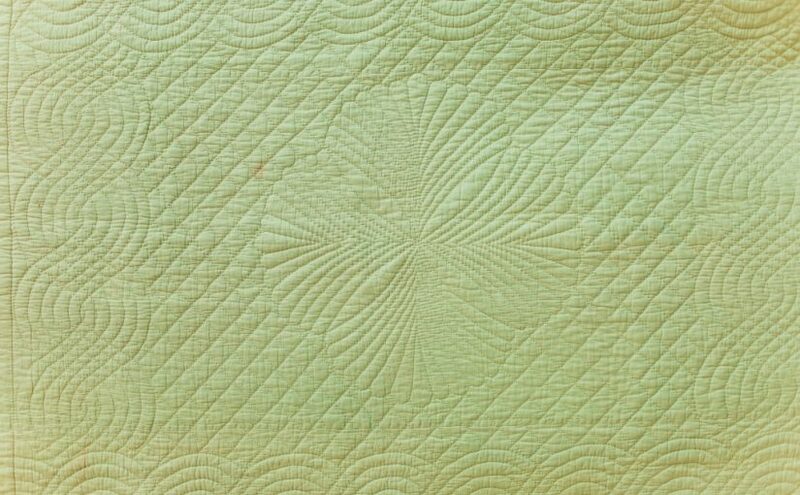 The quilting is quite coarse, and simple in design, with a large, circular fourfold fan motif at the centre, surrounded by wide cross-hatching, and two broad borders. The inner border is a five strand cable, which makes no attempt to turn the corner, but runs on to the edge of the section, butting the next section. The cable border simply runs to the edge, and is butted onto the cable on the next side. Note that the starting point of the cable is different on opposite sides. After two widely spaced framing lines, the outer border is of lined wine-glasses with simple cross-hatch centres. A spray motif is used at the corners. 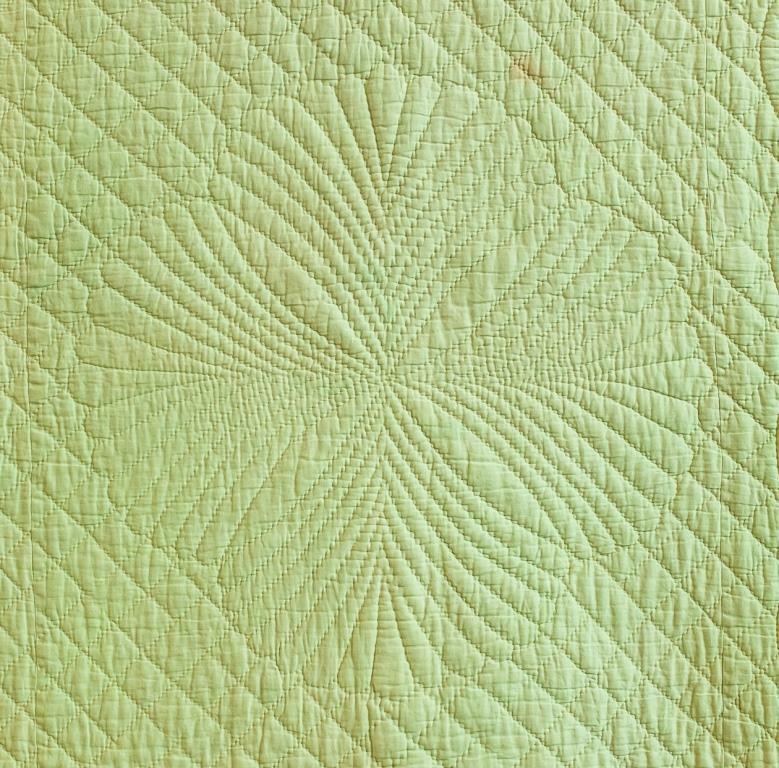 On this corner, a whole circle starts the side border, but the quilter had no room to complete the circle at this end of the top border. 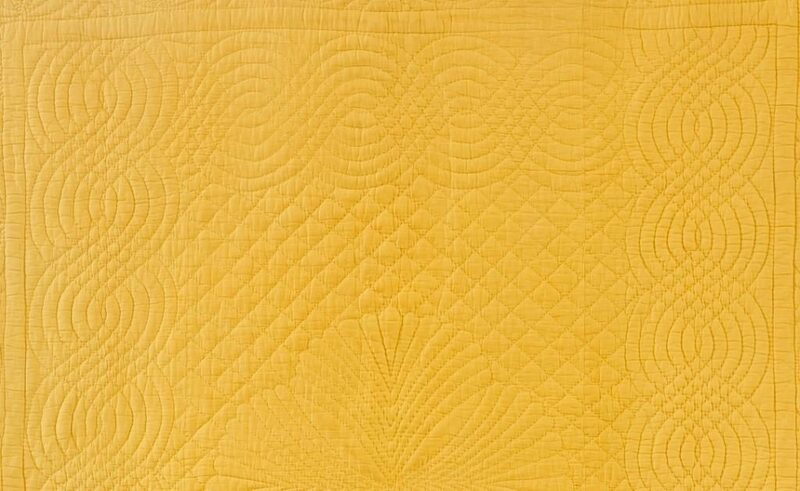 It is possible to see that the quilter quilted the border we see at the top from the corner we see on the top left to the top right. She would have placed the template next to the corner motif and drawn round it with chalk, moved it along, and drawn round again, repeating this process to the end – where she didn’t quite have room for a full circle. If you look back to the large photograph of the whole quilt at the top of the page, you will notice that the same issue occurred as she worked down what we see as the side borders – perfect at our top, but incomplete circles at the bottom, particularly at the bottom right. What we see as the left side was probably the first side worked, as it is more likely that an entire cable would have been worked across the area in front of her, and then the new direction worked away from her, butting onto what she had already stitched. I don’t quite understand why the cable motif in the inner border does not show the same marking pattern – I would have expected her to start the cable motif at the same part of the cable on her right hand side each time, and what we see on the quilt is not the mirror image across the quilt that this would produce, using either the top or the left hand side of the green side as the first stitched side. Did she, for some reason stitch the final border to be worked from the other side of the frame? Non-typical features on a Welsh quilt? This quilt came from Ruthin, Denbighshire, which not far from the Welsh/English border in North Wales. 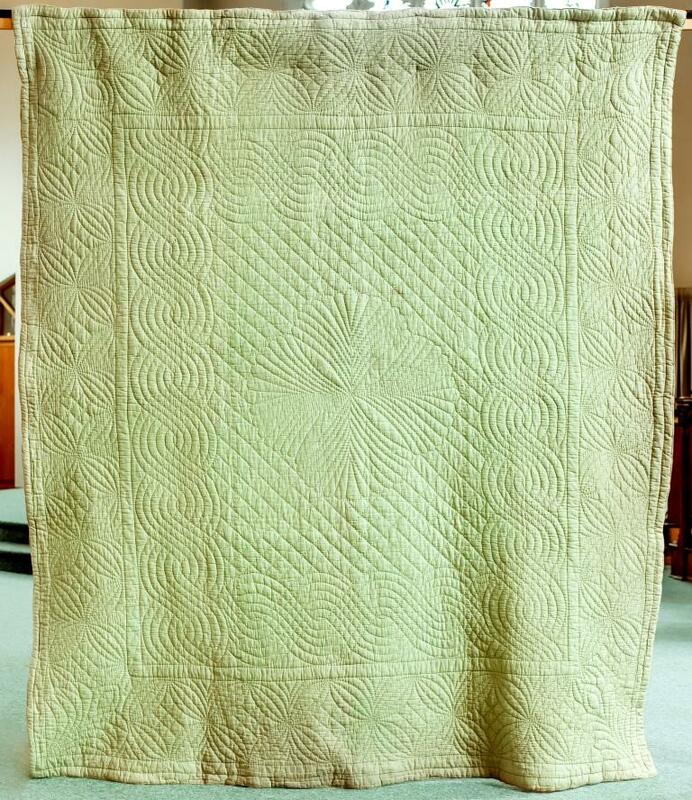 Although it has the typical framed layout of Welsh quilts, several features are different from those found in South Wales: The wadding is cotton, not wool – but as is common with Welsh quilts, much thicker than on North Country quilts. 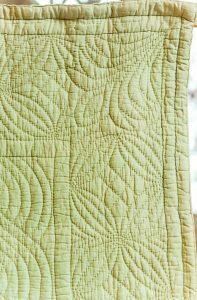 The edge is finished with two more widely spaced lines of hand quilting, with a final machined line right on the edge, whereas Welsh quilts usually have a hand-stitched edge. To see other Welsh wholecloth quilts, why not look at the Pink & Gold wholecloth, the Blue Paisley wholecloth or either of the two quilts made by Q. L. Jones; the Red flannel wholecloth, or the cotton wholecloth by Q. L Jones ?